Fun evening with fellow travellers from across the glide. Started with a visit to an amazing market to buy fresh seafood. Then to the kitchen to join in cooking dinner. Great food and great conversation! 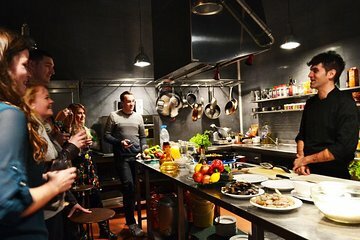 This is a great opportunity to spend a fun evening learning to make paella and sangria. The food was delicious and instructors were a lot of fun! This is a must do for couples or groups of friends traveling! There were 28 of us and we were led by Alex through the market place and through the streets of Barcelona. We had time to get to know everyone and thoroughly enjoyed the experience. You could tell the chef really enjoyed what he was doing, the antidotes he added made this a night to remember. We definitely will remember this night in Barcelona. Great experience and the leaders were really engaging and fun. Had a trip round the markets to buy the food, then a short (and funny) history lesson walking to the restaurant. Food was lovely. Only disappointment was from my understanding of the description we would all be cooking, but due to the large group only 12 could get involved with the workshop. If you are a solo travel this is one way of going put to dinner without feeling alone in a restaurant plus you get the bonus of one or all of the flowing:1) local knowledge of fresh produce and where to procure2)authentic recipe for Paella Barcelona style3) meet people from other coubtries as well as local eg. The chef4) other mentioned local tips. Excellent and highly recommended for travellers keen to learn local cuisines. Met with the Chef and went through the market with him as he shopped for the meal ingredients and then walked about 1/2 a mile to his kitchen for a very different and fun cooking experience. The chef breaks the group into 5 stations of cooking to complete the delicious meal. You sit at group tables with people from all over the world. It was well worth the money, but if you have trouble walking, that could be a problem.great food, great conversation and a great experience. Well worth the price. We had a great time! Excellent sangria, great food, lots of fun. Good opportunity to meet other like-minded people, and share the experience.